The 2018 autumn equinox in the Northern Hemisphere occurs Saturday, September 22, at 6:55 pm PDT (01:55 UT Sept. 23), when the Sun enters Libra. It is one of the two days of the year that the Sun moves across the celestial equator, the imaginary line among the stars that lies directly above the Earth's equator circling from east to west. The Sun's crossing of the celestial equator occurs one other time on the spring equinox. Both times this crossing occurs, the Sun rises exactly due east and sets exactly due west! At this special moment – the instant of the September equinox – the midday sun will be at zenith, or straight overhead, at the Earth’s equator. That’s the meaning of equinox. The September equinox sun crosses the sky’s equator, going from north to south. Who will see the sun overhead at the moment of this year’s equinox? ... Everyone along Earth’s equator on the day of the equinox – and for a day or two before and after it – will experience that noonday sun more or less overhead. Note: The Sun crosses the equator from north to south for both hemispheres at the September equinox, however the daily path of the noonday Sun "springs up" toward the north for the Southern Hemisphere's springtime and continues to "fall" toward the south for the Northern Hemisphere's fall or autumn. AstroViewer the interactive sky map is helpful in seeing this ... Select "Trust" to run applet. Give map time to load in (about 30 seconds). I never found the applet blocked by security settings. Equinox, which means "equal night" refers to a time when the length of day and night are equal. As the Sun crosses the celestial equator, the axis of the Earth points neither toward nor away from the Sun resulting in in 12 hours of darkness and light over the planet. The path of the Sun in the sky intersects the celestial sphere and marks the seasons. 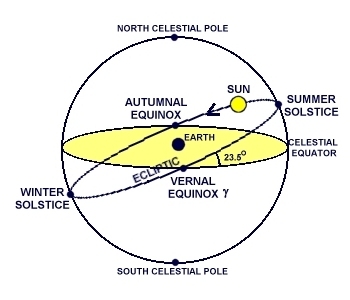 At the spring and autumn equinoxes, when the Sun intersects the celestial equator it rises due east and sets due west. At the summer solstice, when the Sun reaches its highest point north of the celestial equator it rises as far northeast as it can and sets as far northwest as it can. At the winter solstice, when the Sun reaches its lowest point south of the celestial equator it rises as far southeast as it can and sets as far southwest as it can. where the ecliptic crosses the celestial equator. Hmmm ... check out the Spring Equinox page for more equinox facts and surprise your friends with them. during the weeks around the September equinox. There are a variety of equinox global meditations occurring at various times during the day. Participate in one or more of these meditations to strengthen the Light Grid of planet Earth. Those living in both the Northern and Southern Hemispheres are participating in September's equinox meditations. completing the world wide circle Sept. 22.